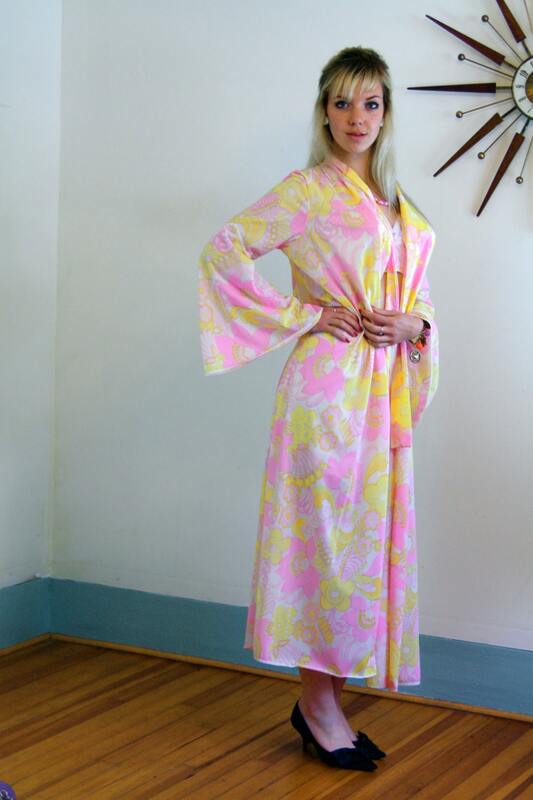 Amazing vintage 60s maxi lounge robe! Bright neon pink and yellow flowers on a white background, with white lace trim and a big pussybow tie on the neck! And the sleeves flare out into full circles! Cool old tag, Made in Egypt! Perfect of era dressing gown/housecoat! Total 1960s MAD MEN lounge suit! Just imagine all the compliments and conversations you will have wearing this outfit! You will know you are the only one on earth who owns this piece! To have a one of a kind gown! That is the magic of Vintage! Model Measurements: bust:34", waist:26", hips:37", height:5'9"